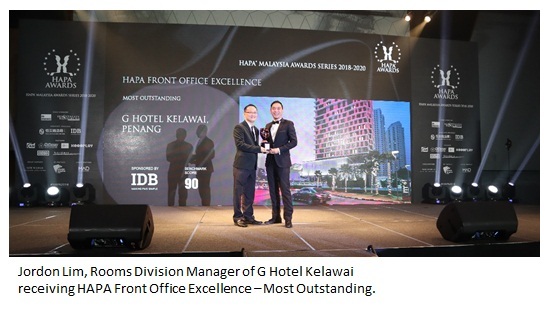 Penang’s G Hotel Kelawai gleaned a total of 4 awards including 1 for the general manager of G Hotel from HAPA Malaysia Awards Series 2018 – 2020 recently at the Gala Dinner held at New World Petaling Jaya Hotel. These prestigious accolades that have been added to its list of accomplishments denotes the 3-year-old hotel as the market leader in the hospitality industry. 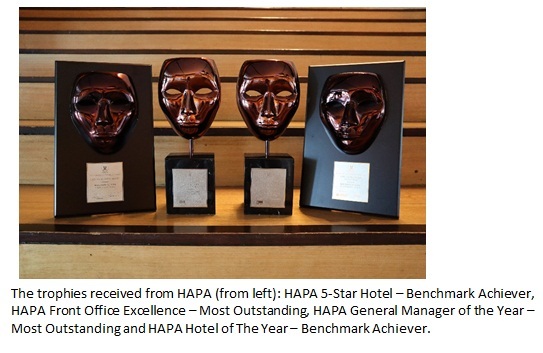 Three of them are HAPA Front Office Excellence – Most Outstanding, HAPA 5-Star Hotel – Benchmark Achiever and HAPA Hotel of The Year – Benchmark Achiever. 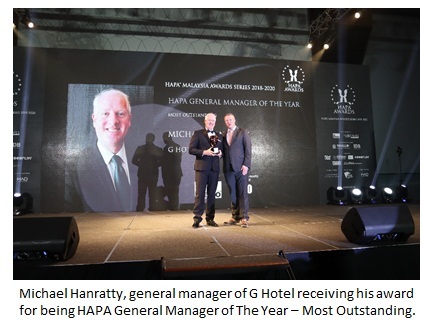 The icing on the cake came in the form of HAPA General Manager of The Year – Most Outstanding for Michael Hanratty, the general manager of G Hotel who has been serving wholeheartedly in the company. In his 6th year, this Australian expatriate received a commendable award for himself and truly attested from the success of G Hotel under his management. 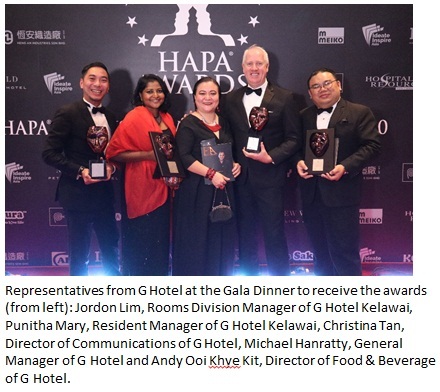 HAPA Malaysia Awards Series celebrates passion, excellence and commitment, particularly of the unsung heroes in the hospitality industry, the back-of-house professionals. This coveted awards are set to recognise Benchmark Achievers as well as the three Most Outstanding Achievers for each category through the unique Mystery Judge Audit system where the judges carry out an on-site inspection on an incognito basis as well as one-on-one interviews and food tasting sessions with nominees. Since 2015, from the pre-planning to the opening of G Hotel Kelawai until the operations today, Michael has personally spearheaded the entire journey. Despite being in the competitive market, it is with much pride that this young hotel’s occupancy has elaborated to 70% occupancy averagely and managed to hit full occupancy many times under Michael’s close monitoring of the Sales, Events & Revenue team. Tapping onto the strength of Penang tourism, collaborating with numerous industrial partners including Penang Convention & Exhibition Bureau, MAH Association and others, receiving continuous support from the corporate companies and establishing close relationship with the media and press, Michael has been diligently going on the grounds to meet and greet at the tradeshows and attending networking activities to develop the business for the hotel. To ensure that the standard of the hotel is on par as the parent hotel – G Hotel Gurney, a well-established Five Star property since 2007, Michael also works closely with his culinary experts to continuously innovate on the menu and the food will be tried and tasted by him personally before they are made available to the guests. This includes the beverages like cocktails in Gravity, rooftop bar and 2PM, lobby lounge. Backed with his rich experience of being in the Front Office department at the start of his career, Michael understands the importance of the feeling of being welcomed in a foreign place and as such he ensures that all guests feels just that, the moment they step into the lobby. He sees to the operation to ensure all guests are greeted in a friendly manner, making sure that the check-in and check out process is simple and fast and even offering a welcome ice-cream to cheer up their day. Therefore, Michael is a very hands on general manager in seeing to the operation and the business of the hotel. The success of G Hotel Kelawai today is thanks to his great leadership and management who believes in the true meaning of hospitality. G Hotel Kelawai tagged as “Style Redefined” is where iconic design and cutting edge lifestyle set the stage for exclusive and extraordinary experiences. The hotel houses 208 rooms that are uniquely inspired by innovative design to create energizing space for guests to work or play by day or mix and mingle by night. In addition to that, it also accommodates three trendy and stylish food and beverage outlets – SPOON, 2PM lobby lounge and Gravity, a 24th floor rooftop bar that are set to fulfil guests’ gastronomic appetites. Every room comes with Serta Royal Platinum Mattresses, Herman Miller designer work chairs, 55-inch smart HD LED TV, Appelles eco-friendly toiletries, 300 thread count linens, alarm clock, ironing facilities, free non-alcoholic minibar and 150Mbps high speed WIFI in all rooms and throughout the hotel. G Hotel Kelawai is located at the prominent location on the bustling Jalan Kelawai, noted to be one of the busiest streets in Penang. Jalan Kelawai is famous for a diverse array of attractions ranging from traditional temples and local eateries to upscale restaurants, boutiques and jewellers. Located within walking distance from the hotel, Gurney Plaza and Gurney Paragon and nearby to tourists’ attractions, UNESCO world heritage sites and beaches, just about everything Penang has to offer is right at your doorstep for unimaginable convenience. Within mere minutes is also Gurney Drive, home to the congregation of roadside iron chefs. To top the vibrance and beauty that this internationally renowned island-city has to offer, G Hotel Kelawai brings award-winning experiences to its guests. It is truly the place to explore, discover and enjoy.